A couple of out maids have their profiles up now! So go check it out! Also, we now have an event page so you can easily see where we'll be next! :D Next on the list is something super secret (but you'll find out soon!) annnnd...A gallery~ Yayay! Maid pages updated with one of our hosts! Also, you can click on the pictures to get to the maid or hosts profile (Which is under construction!) 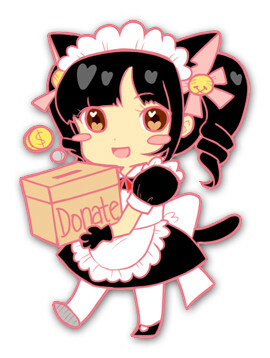 You may notice Donate buttons on each maids page, that is completely optional!! The money will go to each individual maid or host to assist with their travel costs! More pictures will be coming to profiles soon! Also, a super special something will be coming soon! We're working on it! Site updated with out YouTube and a counter to our Ohio event!